Where I live we don’t celebrate St Patrick’s Day that much, but I’ve always thought it was such a fun and colorful holiday! 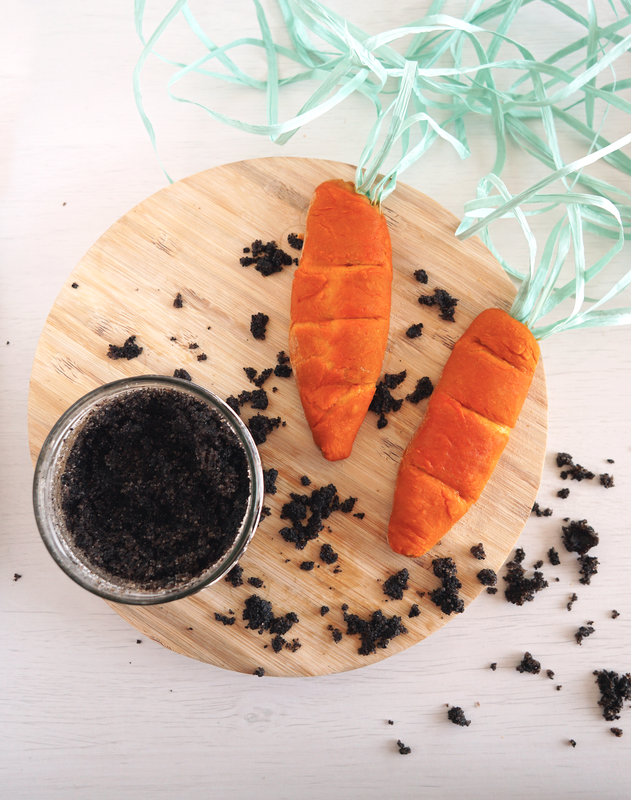 In honor of this Irish tradition, I’m sharing a DIY Hidden Rainbow Bath Bomb recipe with you today.The perfect gift or craft idea to share with your kids, your guests or yourself! Ever since I made my Hidden Rainbow Bath Bombs with embeds I knew I wanted to make an easier, much simpler version as well. The reason why this post was a year in the making is because I never really had a wide enough selection of liquid soap coloring to make a true rainbow. Because after I dropped and ruined my red soap coloring bottle (yep, that was an AWESOME clean up …), I was only left with blue, green, orange and yellow. So when Liz from “How To Look PRETTY” contacted me and asked whether I wanted to try out their skin safe liquid soap dye kit with 12 (!!!) colors, I knew this recipe would be perfect. All she asked for was an honest review of their product and as a thank you she added in a coupon code. 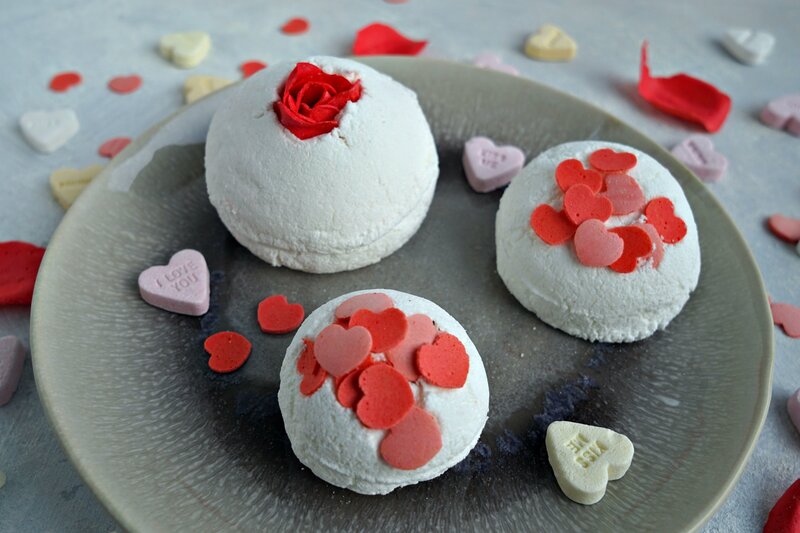 FOR 10 % OFF ALL How To Look PRETTY Bath Bomb & craft supplies enter COUPON CODE “PRETTYUS”. 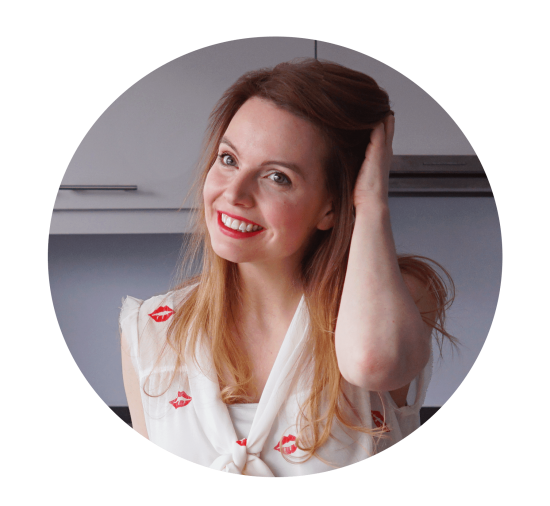 First of all, I like the story behind “How to look PRETTY”. They are a small family business based in the Bay Area in California. And they sell all natural and vegan soap dyes, mica powders and dried flowers without harsh chemicals or toxins via Amazon. The 12 soap dyes come in a small, but very pretty cardboard box. The box was a little dented from shipping, but I was pleased to find all 12 plastic bottles inside intact with no damages or leaking! The bottles are made of plastic which is great for me if you remember my red soap coloring disaster I shared earlier … I already managed to spill melt and pour soap on some of them, so you can imagine my excitement that they are pretty durable! They are a good size, definitely considering that you get 12 colors. You get a wide range of colors too. If you want green for example you can pick between kiwi and jade. For purple there’s lavender and grape. As I’m obsessed with blue I would have loved to see more blue options, like a pretty teal. But I’ve found a color chart on their Amazon page that says when you mix kiwi and blue berry you get teal! I CANNOT wait to try this. I’m also really excited to try out Chelsea. It’s a dark grey charchoal like color that I think will be perfect to make my Hidden Black Bath Bombs or my Melt and Pour Rock Soaps! 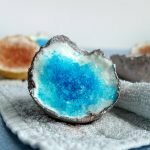 As I only used a few drops for this Hidden Rainbow Bath Bomb, I also tested it out in another bath bomb recipe and to color a clear melt and pour soap base. To color your bath bomb mixture I’ve found these liquid soap colorants work best when you add a few drops of color to your liquid phase, this is the water, witch hazel or rubbing alcohol you use to combine all the dry ingredients into a bath bomb mixture. Mix well like you normally would and watch your bath bomb mixture change color! For the melt and pour soaps I added it to the melted soap mixture and it worked great! Grab your COUPON CODE: “PRETTYUS” for 10 % OFF your purchase when you buy all natural liquid soap coloring from How to look PRETTY. Combine the baking soda, citric acid and corn starch in a mixing bowl. Stir well with a spoon, spatula or whisk to combine all of the dry ingredients. Add a few drops of your favorite essential oil. I added 6 drops of grapefruit essential oil. Next, carefully add some rubbing alcohol or witch hazel to the mixture. This will make the bath bomb mixture clump together. I usually add between 1 to 3 teaspoons of liquids. I’ve noticed the air has been particularly dry for the last couple of days, as I needed to use more liquid than usual. Keep stirring as you add the liquid, to make sure it doesn’t start to fizz in the bowl. Check the consistency of the bath bomb mixture in between by taking some in the palm of your hand and squeezing it. If it clumps together like damp sand, you’ve hit the jackpot! Now it’s time to create our rainbow. First, fill up both sides of your mold with the white bath bomb mixture and press it down with your fingers once you’re at the top. Choose 5 liquid soap colors. I used kiwi, blue berry, rose, grape and tangerine. Carefully place 3 drops of each liquid soap coloring on top of one side, in a star shape. Make sure the drops are spaced out evenly and you stay away from the edges. Top both halves off with another layer of white bath bomb mixture and press both sides together. Tie an elastic band around your mold to make sure it stays close. I like to leave my bath bombs in their molds and dry overnight. I wanted to add a pop of gold to decorate my hidden rainbow bath bomb. 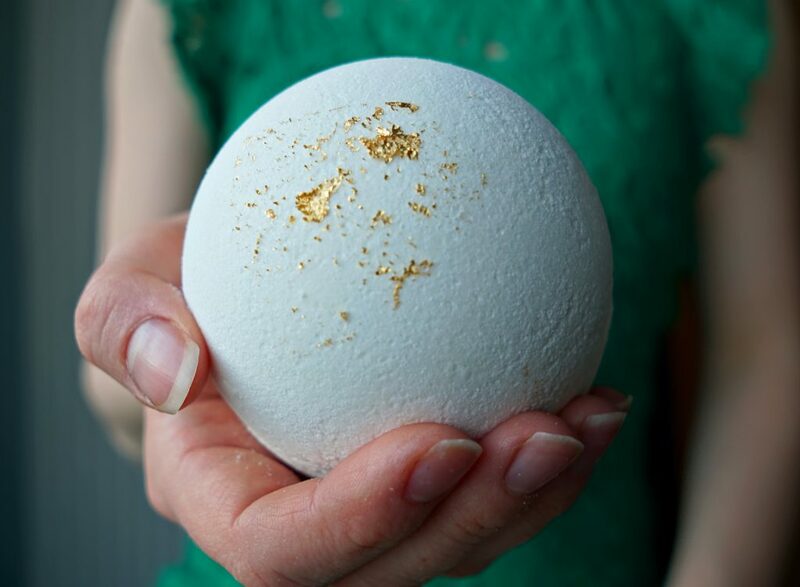 My first idea was to use edible gold leaf, but most of it kept stuck to the bath bomb mold. Such a waste! Since this is a Saint Patrick’s Day inspired craft, I got the idea of painting a Shamrock on my Hidden Rainbow Bath Bomb. I used my trusted method of mixing a little edible glitter with some rubbing alcohol and painting in on with a paint brush. And I really like how that turned out! 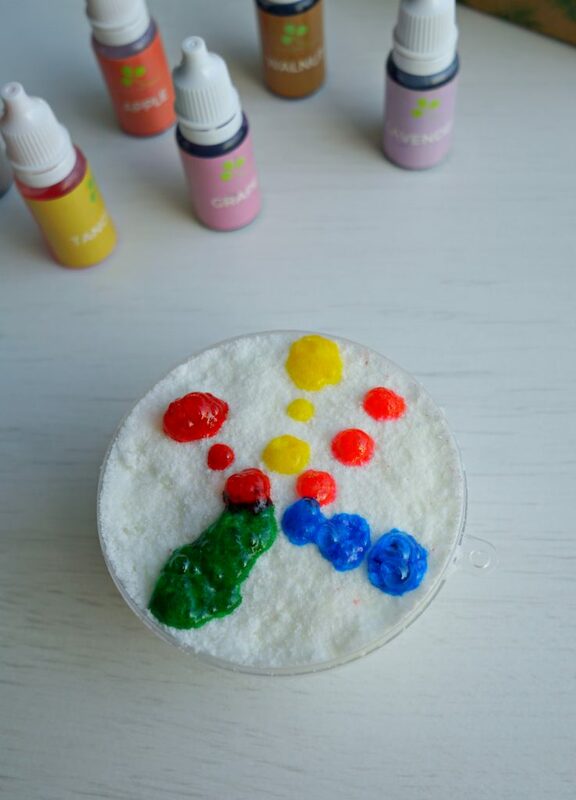 This hidden rainbow bath bomb makes the perfect gift to surprise a friend or family member, a great activity to make and chat about Saint Patrick’s Day or just to keep for yourself! PS: Grab the coupon code “PRETTYUS” for your purchase before it’s too late. 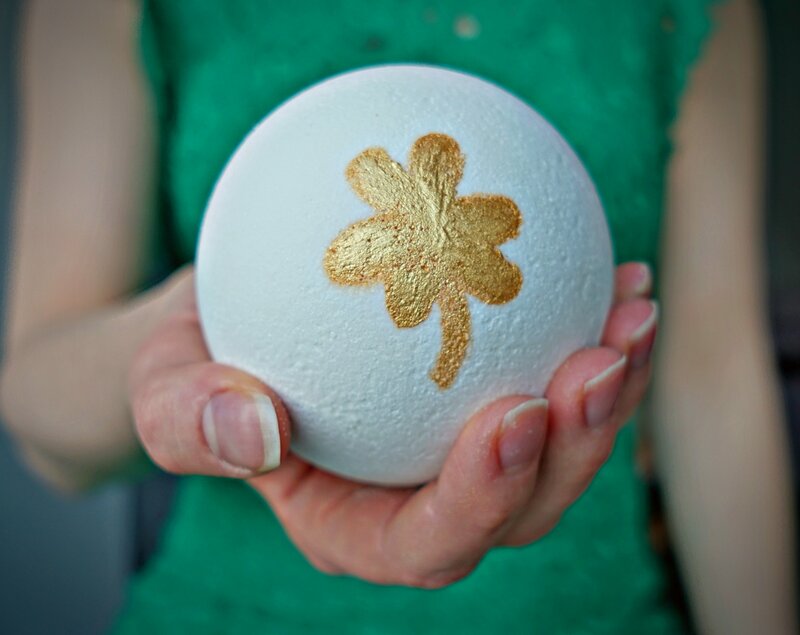 Surprise a friend or family member with this Saint Patrick's Day inspired Hidden Rainbow Bath Bomb! Add the baking soda, citric acid and corn starch to a mixing bowl. Stir well to combine. Carefully add some rubbing alcohol or witch hazel to the mixture. This will make the bath bomb mixture clump together. I usually add between 1 to 3 teaspoons of liquid. Keep stirring. Check the consistency of the bath bomb mixture in between by taking some in the palm of your hand and squeezing it. It should clump together like damp sand. Fill up both sides of your mold with the white bath bomb mixture and press it down with your fingers. Choose 5 liquid soap colors. Carefully place 3 drops of each liquid soap coloring on top of one side, in a star shape. Make sure the drops are spaced out evenly and stay away from the edges. Top both halves with another layer of white bath bomb mixture and press both sides together. Tie an elastic band around your mold to make sure it stays close. To paint the golden shamrock on top, I mixed a little edible glitter with some rubbing alcohol and painted it on with a paint brush. Enjoy! It is so cool! Thanks for letting us know! Thank you so much, Chole! does the dye stain a tub?